Would you like to make more sales — and more money per sale? One really simple way to get both is to create an irresistible bundle of products that your audience can’t wait to get their hands on. Let’s say you’ve created your first minimum viable product. In fact, you’ve done more than that: You’ve been offering digital products for quite a while now. But you’ve seen other entrepreneurs sell some amazing offerings — big bundles of desirable products. Maybe you’d like to offer your audience something similar, but you’re just not sure where to begin. Grabbing a few products from your shop and chucking them together doesn’t create an inviting bundle. Buyers will ignore your offer if they don’t want most of your products — even if your price is low. Put together several similar products. Your bundle could be the best 10 seminars from your membership site, four of your ebooks, or six video tutorials. Put together several different types of products that cover the same topic. For example, if you have an ebook about snail collecting, along with a live seminar you recorded plus several detailed infographics, then that could make a great bundle for all the snail collectors in your audience. In either case, it helps if most of the products in the bundle have been on sale separately and individually, so you can reference a distinct dollar value for each item — and demonstrate how much money your buyers will save by getting the bundle deal. Don’t be tempted to simply create a massive bundle that includes everything in your shop — unless there’s a clear correlation between all the products. What if I don’t have enough products for a bundle? Add more details to an old blog post or podcast. Specifically address the “how” as well as the “why.” You could produce step-by-step instructions or provide real-world examples. Transform existing products into new formats. If you have a bunch of audio seminars, get them transcribed. If you have screenshots explaining a process, consider creating your own video. Different buyers will prefer different formats, so having multiple options raises the perceived value of your bundle. Bundle services with your products. If you offer one-on-one coaching for snail collectors, your bundle could include a 30-minute consultation. Put limits on the services you offer and position them as a “bonus” rather than the core material of the bundle, so you don’t have to raise the price to include them. Have one primary creator (you), and request supplementary materials from several others. Someone with an in-depth ebook might be willing to provide an exclusive sample for your bundle if you link to the ebook’s sales page. Get together with a partner who has complementary products to yours. Find items that aren’t in direct competition but appeal to the same audience. An ebook on SEO and one on using Google Analytics might form a cohesive bundle. Create a massive bundle along with a number of other big players in your industry. Only72 does this on a regular basis with packages that appeal to entrepreneurs. Working with others takes more planning, and possibly presents more of a risk, but it could also mean more reward. Keep in mind that the quality of other people’s products could affect your reputation. Make sure you know and trust everyone you work with and, if possible, thoroughly review (and try) their products to ensure you’d like to be associated with them. You want to put everything in your product bundle together in an easy-to-use way. If you’ve only ever sold individual products before, you might find this requires a bit more work. While you could just shove all of your digital files into a single zip file, that’s not going to create a great experience for buyers. Use subfolders for individual products that contain multiple files, so each folder is easy to navigate. I’ve even seen bundles that used HTML to create a mini, offline site that buyers could use to easily navigate around the bundle. Include a Quick-Start Guide that helps orient buyers and suggests the best ways to start engaging with the package. It could include directions about the correct order to approach the material. For instance, your customer should first read the ebook and then listen to the audio content. Create a password-protected page on your website that has all the product files. I find that a small number of buyers have problems unzipping files, and so it’s best to point people to a page where they can download files at their leisure. Don’t forget to pay attention to file names, too; make them clear and self-explanatory. A cryptic acronym plus a version number won’t help your buyers much. What products could you pull together into a really useful bundle right now? What might you need to add (either by creating it yourself or by bringing someone else on board)? 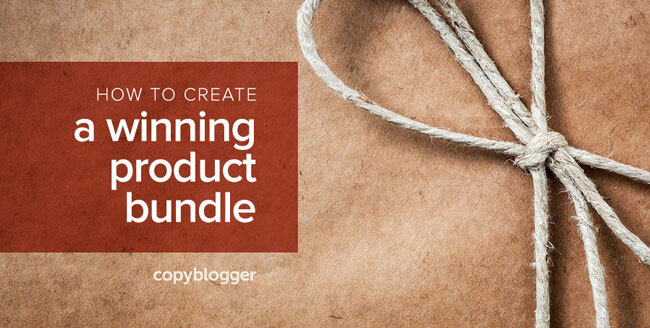 Start getting your plan together now — you might just surprise yourself with how close you are to producing and selling an irresistible bundle. If you’re interested in taking the next step to sell online courses, membership sites, ebooks, and other digital products and services, you should check out Digital Commerce Academy. Digital Commerce Academy (DCA) is your roadmap to building the business of your dreams without squandering time and money, stumbling to find the right path, or making unnecessary mistakes. DCA features full-length courses (including Brian Clark’s Build Your Online Training Business the Smarter Way), 20+ webinars featuring in-depth case studies and education on cutting edge tools, as well as Q&As with the Rainmaker Digital team. The doors to DCA are currently closed, but we reopen them periodically. Join the waitlist below today to be the first to hear when you can join.